One of the best things about being an author is getting to talk to other authors – especially those writing in a similar field to you. One of the writers I have admired for many years who has been really generous with reviews of my books is Steve Taylor. Even more of a coincidence is that we’re both Manchester lads exploring consciousness and what it means to be human. 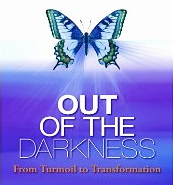 So I was thrilled to speak to Steve recently for my Moments of Light show on Barefoot Radio about his new book, Out of Darkness. Naturally, we covered the others too … namely The Fall, Making Time and Waking from Sleep.